Pretty Organizer is hosting a Toile Party today! I have to admit, I didn't even know what toile was until my sister-in-law decorated her daughter's room in it about 5 years ago. Once I saw it, I recognized what it was, I just didn't know it had a name (pronounced twahl). here is a pillow I found at a yard sale that I have in a wooden box on my fireplace hearth or on my sofa, depending on my mood. The next one is in our bedroom: it's a glass (maybe crystal?? how do I tell?) door knob from our very first apartment after we were married and is from the early 1900;s It had broken off of the door and when they replaced it with an ugly, new brass one I kept it. It brings back so many memories. 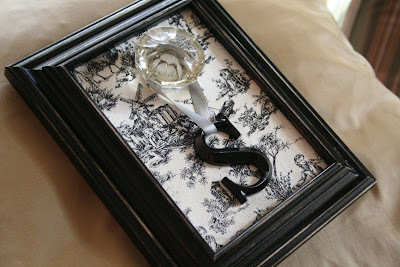 I found a scrap of black and white toile fabric, a little letter "S" from Hobby Lobby painted black and a frame from a yard sale that I also spray painted black. I had to cut a little hole through the fabric and hot glue the knob to the backboard of the frame so it would stay. 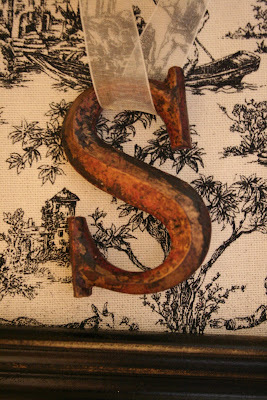 My inspiration for the hanging "S" came from Blue Castle ~I loved hers. So much that I may even paint my "S" red to stand out a little more~what do you think? There are my little touches of toile~there is a whole party of it going on over at Pretty Organized Palace~go join the fun! Wait! Something about that "S" was really bothering me~too shiny, too much black, too something. So, I tried red spray paint. It still didn't fit. So I started wiping the red off, which took off some black as well, and I actually loved the old, weathered look it gave it. It seemed to fit the door knob. So, here is the makeover of the makeover. Tomorrow we'll continue our Yard Sale 101~we'll talk about "at the sale." Until then... happy Tuesday! I love the door knob hanging. What a wonderful way to preserve a memory! I like the S in black, but it would fabulous in a color, too. The door knob hanger is so pretty! What a great idea. I framed some toile scrapbook paper and hung in my kitchen, but I could add a letter and/or a door knob to it for some interest. Love the doorknob!!! What a cute treasure! Love the doorknob! Thanks for sharing. What a great way to preserve that doorknob - so clever of you! Good idea for the doorknob! And I like the idea of extra pillows in random places :) ours just get thrown around the room! I love that doorknob! A while ago I was at an estate sale where they were selling a box full of doorknobs for 15 dollars. I'm kicking myself for not buying some, we were just poor college students. Did you send me your address? I'm worried it might not have worked because I haven't received anything! I love what you did with the door knob. What a great way to remember your first place. Great ideas, you really inspire me! What a cute idea to frame the door knob. I swear I'm getting so many great ideas with this toile party. Thanks for sharing. Have a great day. I love the doorknob! 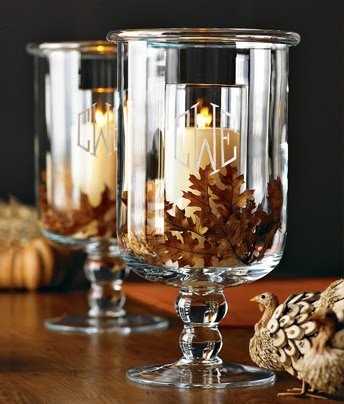 How fun that it is more than a fabulous decoration, but a memory too! Great job! I have no toile in my house, but I love it. And I really like what you did with the knob & the S! I have several knobs... if I can find a B, I might have to try that! Your toile memory frame is so cute! 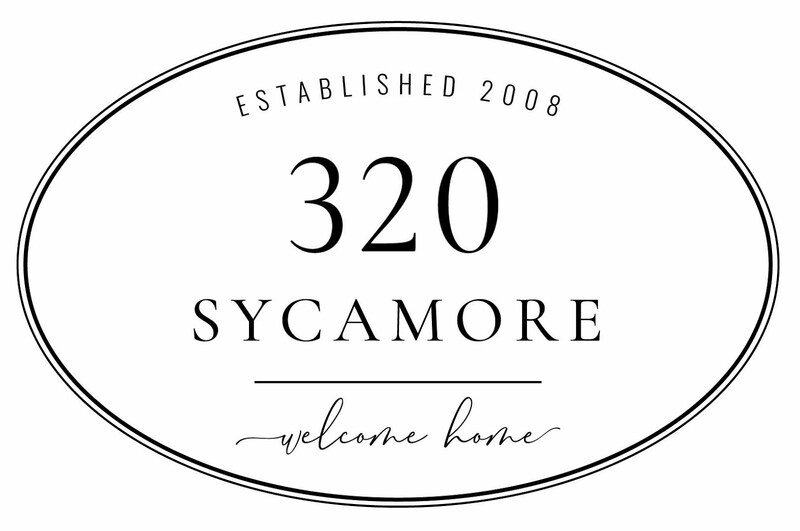 We too have a door knocker engraved with our address and name on it (our first home we bought) that gives me an idea for whenever we move. Love it! What a sweet idea to remind yourself where you've come from! 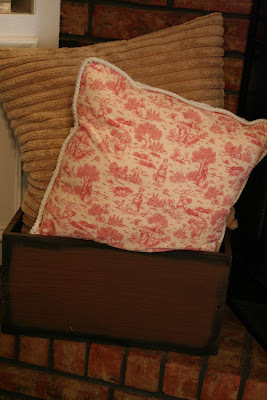 I followed your blog link over from the Toile Party...so glad that I did! 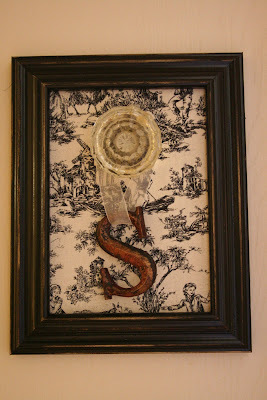 I just love your little toile initial picture! What a cute idea...love that glass door knob! I copied the photo to my computer for future reference, I would just love to make one like this! Thank you so much for sharing your toile with us and making the world a prettier place! Love your toile! I'm so glad I found your blog! What a sweet, beautiful, meaningful project! It came out so wonderfully! I love it!!! I think I like the edited version best,looks more vintage like the knob. But the black "S" was great too. Melissa, I just love your project, too cute! Great Glass door knob project! I have a glass door knob as well and would love to decorate the house with them. Why ever did builders decide shiny brass was the way to go? Thanks so much for shown' your stuff! That is one clever project! Great job! I Love what you did with the "S"! That doorknob is beautiful, and even more so with memories attached. i love your door knob project. i love the black, but the weathered red is interesting as well.